3 min from the place jemaa-el-fna, this traditional house of the medina, welcomes you in a typical Moroccan setting. a stone's throw from the lively derb Dabachi lane, you can relax, in the peace of this intimate and family-run guesthouse. the Riad is accessible by car. The rooms of the Riad are furnished with art and simplicity, for the sake of comfort. Each is thought to make you appreciate the charm of the oriental decor. With discretion the staff is there to serve you. You can rent the Riad exclusively or in the room (the price is for a room). Our family of four had a nice 8-night stay at this riad, centrally located in the Medina. Ahmed was a friendly, smiling presence, who was always available for our questions. Each morning he prepared for us, at 9:00 (early for Moroccans), a large breakfast that included fresh-squeezed orange juice and strong coffee. Breakfast is heavy on bread and sweets, without eggs or cheese, however, so if you're picky it might not suit you. Moroccan mattresses seem to be very hard, which was fine for two of us, but the other two complained a bit. The cool evenings are handled by heaters in the main rooms. We loved the sunny terrace, and would have spent more time there if we weren't so busy doing other things. I really want to give this riad 5 stars, but one incident with Ahmed's business partner, Omar, slightly marred our experience. Omar was there to greet us when we arrived, and his fluent German made it easy for us to communicate, as Ahmed doesn't seem to speak much English. Omar quickly learned our names and used them, which made a nice first impression, and he offered to show us around the next day for a couple of hours if we wanted. We quickly accepted and he got us on foot at 11:00. The 2 hours, full of info and helpful advice, stretched to 3+, and by 2:30 we were tired and hungry. Although we passed several restaurants that looked appealing, Omar said he knew a place he could recommend. After several more minutes of walking, our daughter in particular was tired and starving, and stopped in front of a menu that she said looked good. Omar came over and said it was "too expensive" (without knowing anything about our budget), and when she said it seemed fine, he said the food wasn't "authentic." It was several more minutes before we reached the restaurant Omar took us to, where he was greeted by several of the staff, who clearly knew him. He then left us for our meal, which was fine. During lunch, my daughter noticed that another family was also steered to a table by their guide, who then left. It was obvious that Omar had something to gain from taking us there, which wouldn't have been so bad if our daughter hadn't been in obvious distress, which he chose to ignore. That left a bad feeling. Ironically, it was Omar who had told us, the previous evening, to "trust no one." For that reason, I can't give a perfect score to the experience, although the riad itself and Ahmed's solicitous presence were lovely. The riad is beautiful. Spacious, clean, very comfortable. Omar is very friendly and very helpful. We couldn't ask for better accommodations or a better host! We loved staying in the riad right near the center of the medina. It was comfortable and unique. Our host, Omar, was charming and very helpful! I would recommend it for everyone. Wonderful spot. Everything organized perfectly. Ahmed and Omar started our family vacation off perfectly from arranging our transfers to places to eat and do and helping us with lost luggage. The accommodation was clean and lovely. The breakfast was the best we had anywhere. The location was great with easy access to the medina. 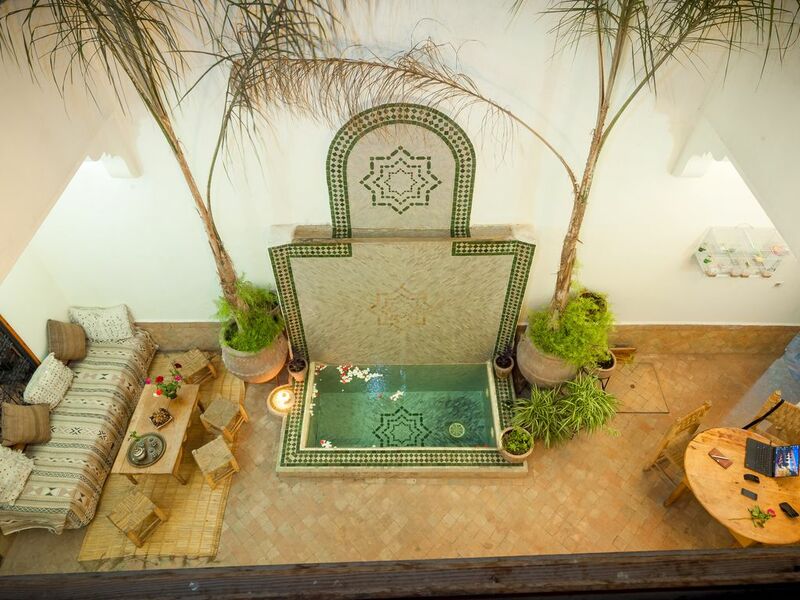 We highly recommend this riad. Lovely, small riad, perfect for a family visit. We hired the whole riad for 2 adults and 3 children aged 5, 5 and 6. It was spot on - lovely and clean, lots of space and perfectly hosted by Ahmed. Missing his huge breakfasts already. My mother and I had a great stay at this riad. Ahmed is helpful and friendly. The breakfasts were very big, meaning we had no need to spend money on lunch. The room was small and the beds a little hard, there was a shortage of storage space for clothes-hence only 4*. We needed the air conditioning, which was quiet and effective. The location is pretty central and the transfers smooth. We went for a trip to Fez and the returning train was 90 mins late...11.30pm! Still Abdul the taxi was waiting for us and Ahmed was waiting in the riad..brilliant hospitality. The use of the kitchen and lounge was very handy and the visiting wild sparrows were charming.